Subaru set out to design a new chassis to take “comfort” and “handling” to a completely new dimension. 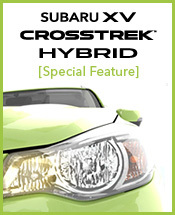 One of the featured characteristics is the rear double wishbone suspension system. The system increases contact between the tyres and the ground, and negotiates bumps in the road surface smoothly for supreme ride comfort, regardless of which seat passengers sit in. Handling has also been improved by increasing contact between the tyres and the ground at the front of the vehicle, with an increase in mounting rigidity of the more conventional front strut suspension. With the Legacy in particular, mounting the front suspension to the cradle frame increases rigidity further and improves steering response.